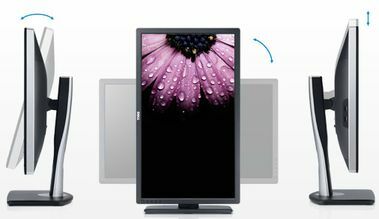 This models features an upgrade of the In-Plane Switching (IPS) panel to AH-IPS (Advanced High Performance) instead of the more common P-IPS (Professional) panel. The model won a PC Mag Editor's Choice award (as many previous models of Dell's Ultrasharp line have). They listed the positives as "Outstanding color quality. Very good light grayscale performance. Features galore." Their only negative criticisms were "So-so dark grayscale performance and no auto-rotate feature." For people serious about the quality of the images they work with and who need a gi-normous screen, this model makes a great choice.